Anaxi, the software development tool that helps developers get a better view of their projects in Jira and GitHub, is launching a small but nifty addition to its iOS and web apps today that allows developers to cut down on the steady stream of notifications and updates those services create. 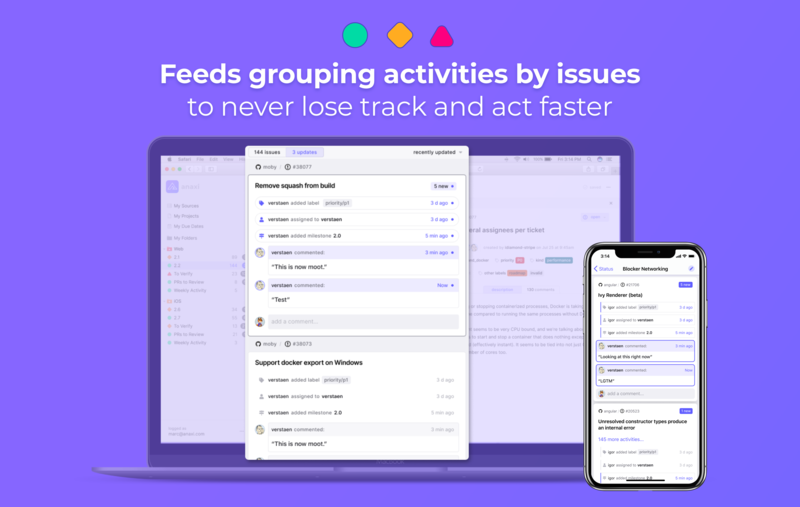 The company, which was founded by former Apple engineering manager and Docker EVP of product development Marc Verstaen and former CodinGame CEO John Lafleur, rightly argues that tools like GitHub and Jira weren’t really made for personal productivity. Developers waste a lot of time going through updates and tickets in Jira, for example, some of which may be relevant and timely, while others are only distractions. In the end, you end up constantly switching context from ticket to ticket, which tend to be grouped in chronological order, and you may still miss important information. The way the team is trying to bring more clarity into this process is through feeds. The idea here is to allow developers to create dedicated feeds for whatever they need to focus on — maybe that’s a sprint or a single component of an app they are working on. That way, whatever you are looking at in Anaxi is relevant to your work because you can create filters based on issue, priority, status and any other label you want to track. From inside Anaxi, you can then also comment on tickets. Anaxi first launched last September. At the time, it was an iOS-only service, but the team has since launched a web client, too. While the service does cache some data locally, no information is ever shared with Anaxi itself. Instead, the service pulls its data directly from the services it supports. The team is considering some server-side features, though, to maybe use machine learning to prioritize tickets or perform other more advanced analytics. As Verstaen and Lafleur tell me, though, this will be very transparent to users — and is also still a while out. In the near future, the team is more focused on adding support for GitHub Enterprise users and Jira Server, which will open up the service to more enterprise users.